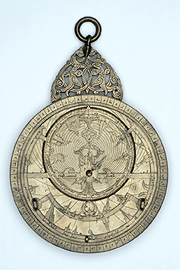 This early Persian astrolabe with a geared calendar movement is the oldest geared machine in existence in a complete state. 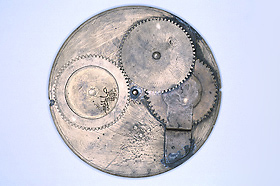 It illustrates an important stage in the development of the various complex astronomical machines from which the mechanical clock derives. Islamic scholars learned of this design from a text by one of the greatest Islamic scientists, al-Bîrûnî (973-1048), who explained how gearing might be used to show the revolutions of the sun and moon at their relative rates, and to demonstrate the changing phase of the moon. These phenomena were of fundamental importance in the lunar calendar used in Islam.